Btw, my husband was an insurance salesman when we first started dating. Lol, where was this ingenious quote then. I sure could have used a bit of Woody Allen wisdom as well as some relationship redirection. One crazy and emotion filled night me and my bff were going through some boxes of my husbands old junk that he never unpacked when we moved into our house. The goal was to sort the junk, trash unecessary crap, condense the keepables and rebox it up labeled. We get into a pile of some of the stuff he’d kept from his days as an insurance salesman. There where pages and pages and piles of leads (really, why would he keep that crap for 12 years) and pay check stubs. Then we seen it. Laying there like a treasure of hilarity waiting patiently for the day it would be found and appreciated to the asurdity it was. 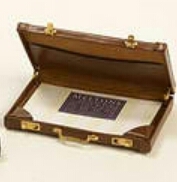 WHO THE HELL NEEDS A MINITURE BRIEFCASE!?!? We laughed for hours, making up and acting out scenarios in which one would use such a small briefcase. Mocking and laughing at the complete rediculousness of our find. We still laugh about it when we think about it. Try and live your life in a way that you will not regret years of useless virtue and inertia and timidity. Take up the battle. Take it up. Its yours. This is your life. This is your world.